Over the next few weeks local residents can have old fruit tree removed as part of the Fruit Fly Control project at no cost. Over the summer months Wangaratta Sustainability Network in partnership with Farmers Market have been providing Fruit Fly Traps and other general information to assist back yard gardeners control fruit fly. Following on from this, the opportunity is now available to have neglected and unwanted fruit trees removed from private properties. According to Mark Townsend of Wangaratta Sustainability Network, “Feral and neglected fruit trees are a problem as they harbour fruit fly and create a problem for others in the neighbourhood who are keen gardeners and doing the right thing to control fruit fly. At times these might be large old trees that have grown to a size where they cannot be managed. Also when a property changes hand or there are new tenants, the existing fruit trees can become a management problem for them. Funding to assist fruit fly control locally has come from the Victorian Government and the tree removal will be done by a professional crew. This removal of unwanted back yard fruit trees has been successfully undertaken in the Moira Shire as part of a strategy to protect the local fruit industry. 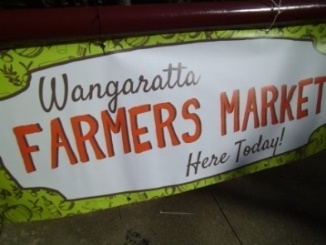 The Farmers Market in partnership with Wangaratta Sustainability Network have received funding to assist in controlling fruit fly. 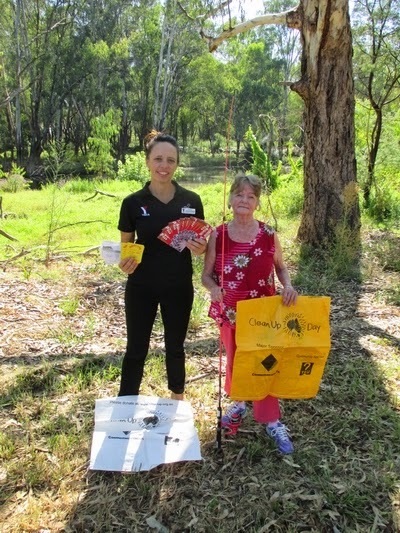 Support is available with free Fruit Fly Traps in participating neighbourhoods of Wangaratta. Whole neighbourhoods are encouraged to be involved and extra support can be provided to assist your active neighbourhood. It is difficult for backyard gardeners to control fruit fly alone. 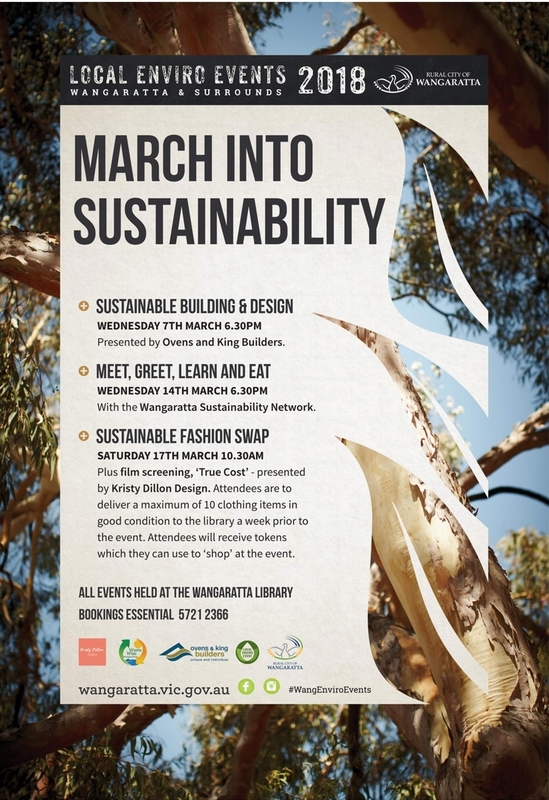 Email : wangarattasustainability@mail.com and ask if your neighbourhood can be involved. 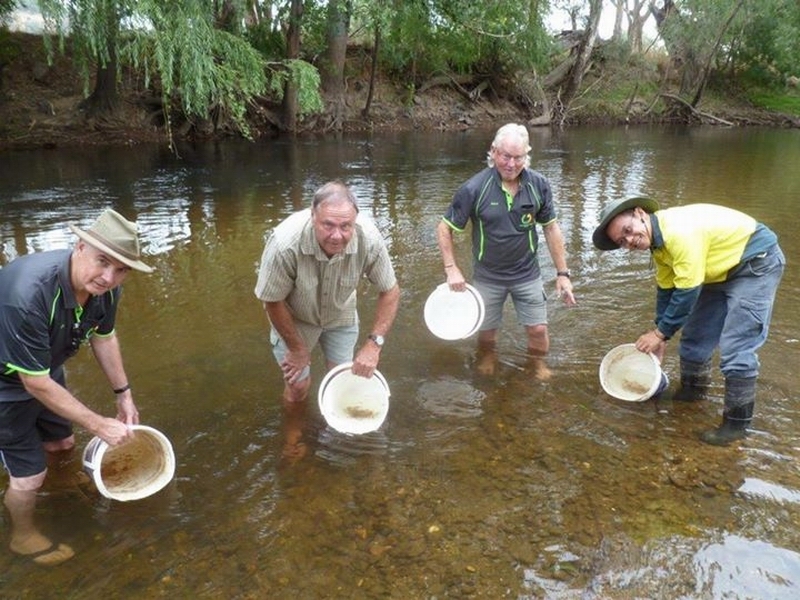 Recently Kelvin and Paul from WSN visited two dams in South Wangaratta after the owners reported having carp in them. Both dams were dragnetted with one dam yielding 19 carp and the other five carp (one heavily egg laden). 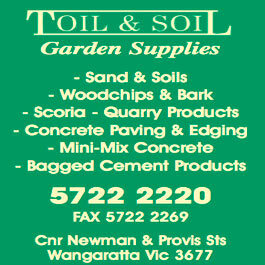 If you suspect you have carp in your dam you can contact Kelvin Berry on 0407 805 670. Many thanks to Toil and Soil for the use of a 3 ton tipper and Hansons for donation of rocks for a Borinya students project. · Overall a great day. The children love SEED Day & gain a lot from the presenters. · It was a fantastic day! Activities were extremely relevant & the children were really engaged. 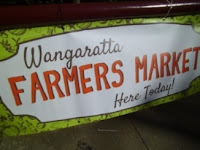 · Great selection of workshops. Loved having secondary students also part of the day. 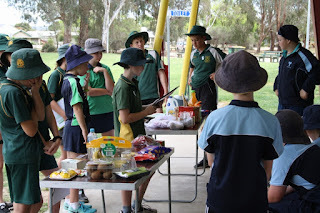 · Students enjoyed practical activities and being able to participate in different events. · A fantastic interactive day. Well organised and resourced. 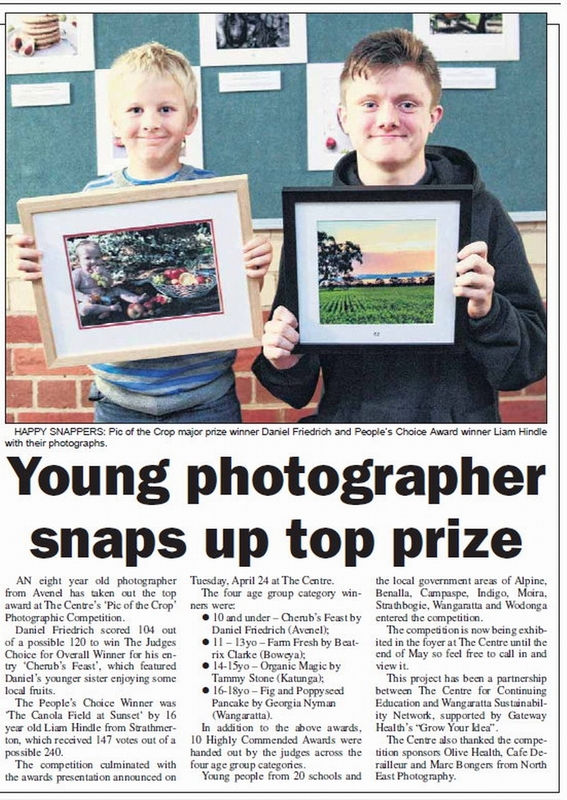 · A great comparative task that provided an awareness of the environmental impact of waste. 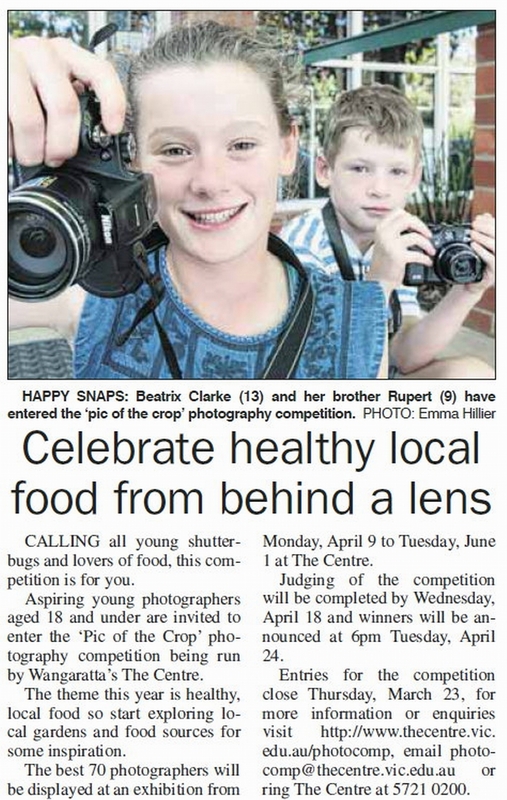 The recently held forum in Wangaratta involved respected, knowledgeable and interesting speakers. Seven presenters have kindly agreed to having their talks available to view here or on the Climate Change tag above. 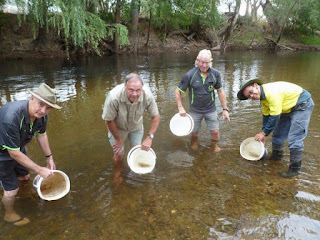 More than 8000 Macquarie Perch fingerlings were released into the Ovens River between Wangaratta and Whorouly on Tuesday (31 January) in another boost for the nationally threatened species. This unique project involves several government agencies and the community including local schools, and hopes to re-establish a viable self-sustaining population in the Ovens catchment. The program has been accelerated over five years instead of 10 by also including the translocation of larger fish from Dartmouth Dam as well as the fingerlings reared at the Fisheries Victoria hatchery at Snobs Creek. 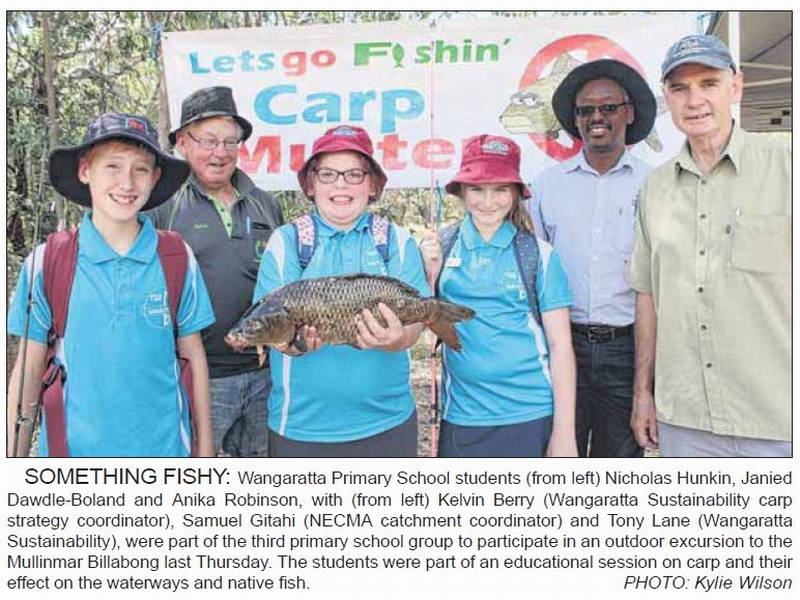 Prior to the 1950s MacPerch were abundant in the Ovens River but were considered extinct before this re-introduction program commenced. Pictured: Ian Davidson (Ovens Landcare Network), Huiking Ho (Fisheries Victoria), and Tony Lane and Kelvin Berry from Wangaratta Sustainability Network, and landholder Paul Kneebone. 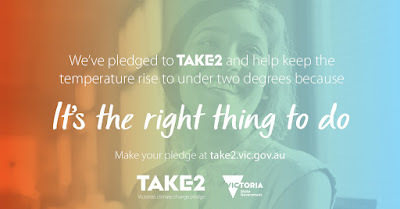 Wangaratta Sustainability Network is a Founding Partner of TAKE2 and encourages other organisations and individuals to make their TAKE2 pledge at www.take2.vic.gov.au and then choose the climate change actions they will take to do their part. 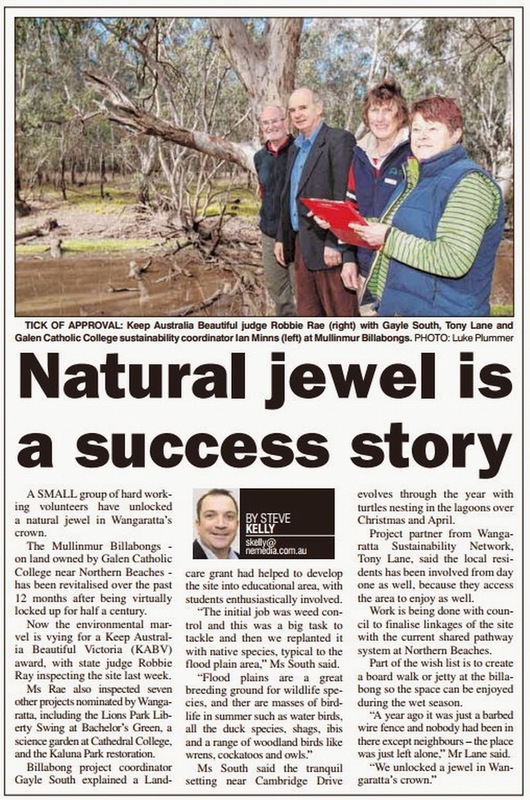 Article from Border Mail re Wangaratta Sustainability Network's Climate Action Group. 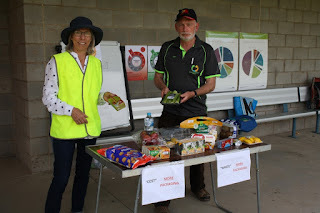 This article has information about the presentation of our climate change petition to Cathy McGowan on November 8 and attending the People's Climate Change March on November 27. Did you miss the North East Victorian Carp Conference? Click on the links below to get some of the important information shared. The Mullinmur Billabongs area, On Galen College land has been revitalized. 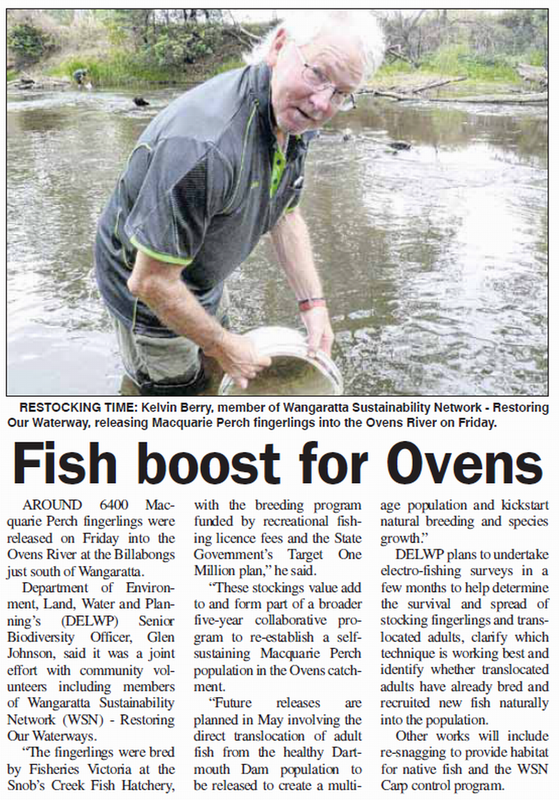 Please click on the link to view a new video showcasing the collaborative multi-agency & community project helping to re-establish the Macquarie Perch into the Ovens. 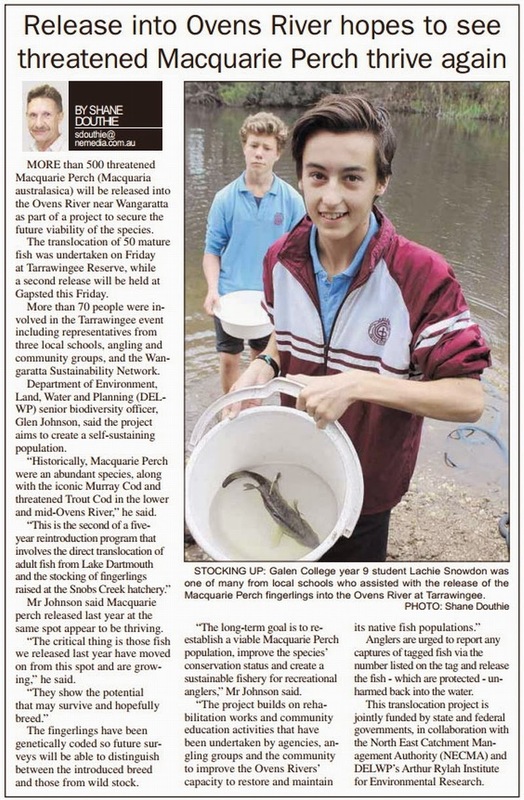 WHAT IS HAPPENING ABOUT FERAL FISH IN OUR LOCAL AREA. 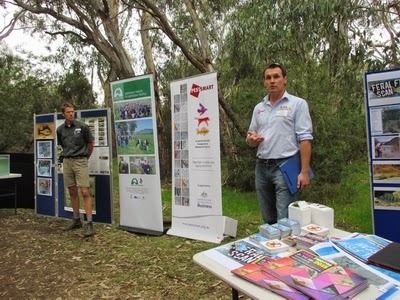 The FeralFishScan is a new resource that was demonstrated by Peter West from Invasive Animals Cooperative Research Centre (IACRC) on Friday the 24th April at the Ovens River, Tarrawingee. The FeralFishScan is a mapping resource for communities to track and record the presence of pest fish species in our waterways. 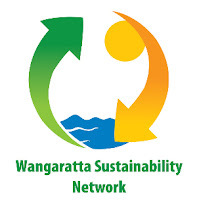 Wangaratta Sustainability Network– Restoring Our Waterways (WSN) has been heavily involved in the removal of Carp from our waterways and this resource is going to be a fantastic tool for local members of the community to assist WSN – ROW with our Carp Removal Programs that have been taking place over the past four years. It will assist us in knowing what areas to target next Summer and in the future and will help us to put in place and achieve our effective three year management plan”. In May, WSN will be releasing a full report on our Carp Removal Program which has taken place over the past few years, and will include the number of Carp removed from our local Rivers and Creeks, and the weight transport to NutriSoil for recycling, which will astound you. By entering your data into the FeralFishScan you will help WSN plan future management control of Carp in our local area. 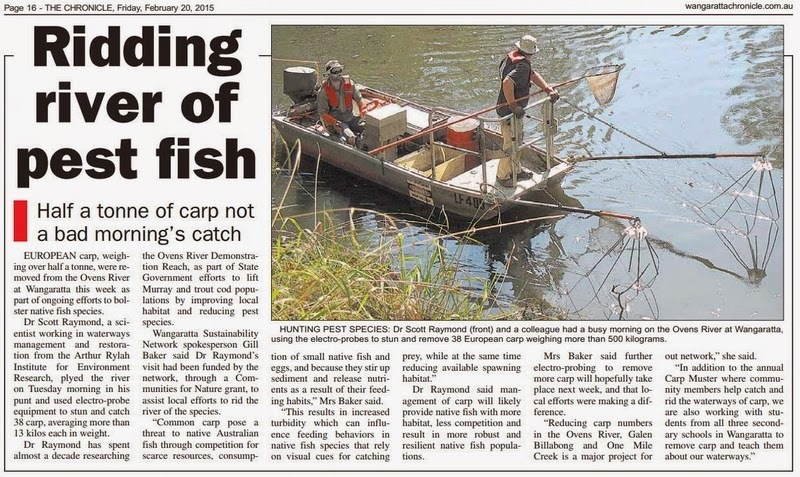 The mapping of carp spawning sites is particularly important for controlling their numbers, and this data entered will be helping WSN – ROW to map feral fish hotspots, identify breeding sites, and control feral fish in our local area. Kelvin Berry WSN – ROW Fishing Coordinator along with other WSN-ROW members attended the FeralFishScan Launch Event on to ensure we gain all the necessary information about the FeralFishScan that was presentef by Peter West from IACRC. There is always something happening to control feral fish locally and you can learn about current programs and how you can get involved by checking out the Wangaratta Sustainability Network’s website: www.wangarattasustainability.org WSN - ROW are always looking for new members and volunteers to help with our programs. Tim McCurdy MLA, also attended this community event.